The Kurds have courageously sided with the Coalition of the Righteous (COR) and vastly increased the organization’s viability, but the speed with which they did so makes one wonder whether they could just as quickly be ‘convinced’ (read: bought off) to return to their unipolar allegiance. So far there’s nothing tangible that points in this direction and all reasoning is conjectural (although rooted in experience), but the situation might predictably arise where the Kurdish Regional Government (KRG) and Baghdad return to loggerheads over Kirkuk and the KRG-central government oil-revenue sharing deal in the aftermath of the anti-ISIL war. In such an event, the KRG could once more resort to independence rhetoric as a method of extracting political gains from Baghdad, but this time (with American and Israeli backing) it might take conclusive steps to achieve this, such as a snap referendum that’s immediately recognized by Washington and Tel Aviv, et al., no matter how negatively this affects each of their bilateral relationships with Turkey (which they might be eager to provoke if a pro-Eurasian military coup there does in fact occur). The consequences of this scenario would be extremely destabilizing for the COR, as it would result in the creation of a ‘geopolitical Israel’ that could exert influence on the Syrian and Iranian regions where its ethnic kin reside. Moreover, it could also lead to the trilateral fragmentation of Iraq proper, as it’s unlikely that the rump Sunni-Shia portion could remain intact with its heated domestic differences, especially if a Kurdish-Iraq War suddenly broke out soon afterwards (maybe over Kirkuk). Per that possibility, it’s not foreseeable that the rump country would be able to muster enough unity to fight back against the ‘Mideast Prussia’, and the resultant strain could easily divide the remaining population to the point where further separation is seen as not only inevitable, but actually something welcomed by both sides. Considering this, it becomes very important that Russia and Iran influence the Iraqi central government to accommodate a fair share of the KRG’s reasonable post-war demands, and importantly, that the Kurdish leaders feel confident enough in the trust they’ve given their Moscow- and Tehran-based counterparts so as not to enter into any backstabbing side deals with the US at the same time. The stabilization of Syria will unavoidably result in the EU trying to deport most of the hundreds of thousands of asylum seekers back to the country sooner or later. Every Syrian citizen has the legal right to return to their homeland, but the situation in practice is a bit more complex than that. Just as outgoing refugees were used as a weapon against Syria, so too could returning ones be as well. For example, many of the Syrians that fled their country for Turkey or the EU don’t support their democratically elected and legitimate government (which isn’t necessarily the same for those went to Lebanon), and forcing them to return there against their will could create tension with the patriotic Syrians who remained. Not only that, but simply in terms of the numbers involved (over 4 million abroad at last count), it could be overwhelming for the authorities of any country if so many people (were forcibly) returned in a short period of time. Therefore, Syria needs to be alert to the possible weaponization of returning refugees, and should thus prepare an organized system for handling them so as to avoid any destabilization that could occur. It should once more be emphasized that any large-scale refugee return happening within a short period of time wouldn’t be voluntarily occurring, but unnaturally forced by the EU, many members of which have grown tired of hosting the refugees and simply want them gone. Interestingly enough, prior to the Russian anti-terrorist intervention, UK Prime Minister David Cameron spoke of launching a military campaign against Syria in order to create a situation supposedly amenable to the refugees’ return (in the Western understanding, after regime change). So, with this in mind, now that Russia’s military campaign against ISIL is literally making the country more livable by eliminating the murderous terrorists that plague it, it’s possible that the UK, and for that matter, perhaps even most of the EU, could resort back to the rhetoric of sending refugees back if they acknowledge that the domestic conditions provide ‘plausibly justifiable’ enough reasons that. This might entail the refugee-returning countries de-facto recognizing Syria’s legitimate government, but even if they do, it would only be a temporary tactic to allow them the chance to flood the country with some of its hundreds of thousands of citizens that have already made it to Europe by that time. While physically powerless to do anything to stop the Russian-Iranian strategic convergence against ISIL, the US and its information organs (both those explicitly recognized and such and more covertly acting sympathetic outlets) can play up false stories of a competition between the two in Syria and/or Iraq with the ultimate hopes of maximizing any suspicions one may have of the other, to the point of creating a ‘security dilemma’ that engenders an actual fallout. It doesn’t seem at all probable that this would happen anytime soon, but if ISIL turns out to be harder to dislodge than previously thought, and the COR campaign stretches on longer than expected, then the contextual backdrop could be created where such vicious rumors might find some adherents in Moscow and Tehran. 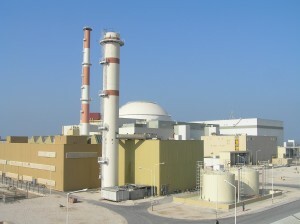 Bushehr Nuclear Power Plant built in Iran with the Russian technical assistance. Russia and Iran are closer than they’ve ever been at the moment as a result of their military collaboration against ISIL, but there’s still the possibility that the differences between them (which the author comprehensively listed out in a four-part series on the issue) could once more return to the surface with time. This becomes even more foreseeable if the US and its German, French, and UK allies find some way in which to falsely accuse Iran of violating the nuclear accord as a twisted form of geo-economic vengeance for militarily siding with Russia in the New Cold War. When one recalls how these leading EU economies abandoned the money they were already making in Russia out of loyalty to the US’ political considerations, it’s not hard to think that they’d do the same for profits they have yet to even receive in Iran. The mere threat of doing so and possibly returning to the sanctions regime (and the Color Revolution tripwire this could activate) might be enough to coax the pro-Western “moderates” into a major behind-the-scenes power play to wrest control of the Islamic Republic from the geopolitical pragmatics (the Western so-called “hard-liners”), or in a less dramatic fashion, ‘nudge’ Iran away from its military closeness with Russia and into a more passive COR role. The West’s goal has and always will be to enact some form of hard (Color Revolution) or soft (“moderate”) regime change in Tehran that disarms the country’s military-strategic establishment and opens the door for the return of pre-1979 foreign exploitation. Now that Iran has conclusively sided with the Russian-led anti-ISIL coalition, it’s exposed itself once more as an urgent target for Western intelligence agencies, who will stop at nothing to get the country to reverse or lessen its commitment and enter into odds with Russia. This is definitely easier said than done, especially now that Moscow and Tehran have demonstrated such trust between one another through their work in the COR’s Baghdad information center, but this sly tactic of dividing Iran from Russia can’t ever be discounted or taken off of the table of tricks that the US and its allies will employ. As it’s dictated by one of the primary geopolitical imperatives of Western policy towards Eurasia, it can be taken to be a perpetual threat, even if it (hopefully) mitigates in intensity with time. Russia’s increased military presence in Syria makes it not only a Mideast power, but also an Eastern Mediterranean one as well (with A2/AD capabilities). Expanding on the latter, this ups the country’s presence near the southern shores of the Balkan region, which correlates with Moscow’s intentions to perform a Balkan Pivot and increase its influence in this Western-neglected area of Europe. Thus far, ‘Round Three’ of the New Cold War saw Macedonian patriots defeating the Color Revolution and Albanian-affiliated Hybrid War attempts that were externally designed to sabotage the country’s stability and prevent it from ever being used as a multipolar-oriented transit state for Russian energy and Chinese high-speed rail. The first battle for the Balkans was won, but the war is far from being over, since there are three principle unresolved destabilizations that can blow up at any time: (1) a second Color Revolution/Hybrid War venture in Macedonia before or right after the early elections in spring; (2) the geopolitical problems of ‘Greater Albania’ and Dayton-revisionist Bosnia; and (3) the region-breaking refugee crisis. Victoria Nuland also has her own pet projects for how to throw the Balkans into bedlam, but they can all reasonably fail with good measure. What should be understood by the reader after this citation-heavy above paragraph is that Russia has concrete geopolitical considerations behind its urge to civilizationally relink itself with the Balkans, while the US is exerting just as much effort to prevent this from happening and frantically finding ways to institutionally (such as Montenegrin and maybe even Macedonian NATO membership) and physically (Hybrid War in Macedonia or a ‘refugee revolt’ in Serbia) split the region off from Russia. Make no mistake – Washington has already planted multiple ‘ticking time bombs’ in the Balkans that it’s planning to remotely set off in the near future, the question is just whether or not the region can withstand such destabilizing blows and how (if in any way) Russia can assist it throughout the oncoming geopolitical ordeal. With the Balkans being the ‘soft underbelly’ of the EU, which itself is the US’ largest Eurasian colony, Washington will fight back as viciously as it can to prevent Russia from establishing a strategic foothold so close to its ‘prized harlot’. It was already ‘overdefensive’ of its ‘catch’ even before, going as far as to engineer EuroMaidan to keep the two away from one another (moved forward because of the 2013 New Cold War loss the US received in Syria), but faced with an embarrassing, unprecedented, and surprising strategic withdrawal from the Mideast, it’ll probably spare no strategic or physical expense in making sure that Russian influence doesn’t move an inch closer to the Balkans during these tense geopolitical times. It doesn’t mean that this will stop Russia from endeavoring to do so, or that Moscow won’t ultimately succeed, but that it’s very probable that the New Cold War battlefield will once more cycle back to the Balkans after the Mideast (Syria) and Eastern Europe (Ukraine). The last forecasted way in which the US could significantly take revenge on Russia for its grand Mideast power reversal is to indirectly strike at its interests in Central Asia, specifically along the Afghan border. It has just been revealed by Russian Defense Minister Sergei Shoigu that last month’s ultra-large-scale Center-2015 strategic exercise was aimed at both combating ISIL in the Mideast and the Taliban in Central Asia. As written about in Part I, if Russia continues to make proper use of coalition tactics in fighting against regional threats, it can wisely avoid the pitfalls of the Reverse Brzezinski stratagem, but it remains to be seen if Moscow could simultaneously handle two or more separate campaigns in two different regions (the Mideast and Central Asia). If, for example, the Taliban, ISIL, and/or a hybrid combination of Islamic terrorists succeeds in capturing territory along most of the former Soviet-Afghan border and recruiting many Central Asians to join its ranks, how exactly would Russia respond? Looking at this scenario, it could quickly become a logistical-diplomatic nightmare, precisely because of the three separate military commands that could potentially (and maybe even concurrently) be involved. Tajikistan is part of the CSTO, which of course would be under Russian leadership, but Uzbekistan removed itself from the bloc in 2012 precisely so it could be less tied to Moscow. Turkmenistan, which has seen the Taliban steadily gathering ever more frequently along its newly fortified border, isn’t in any military bloc and officially pursues a policy of neutrality. If there was a coordinated jihadist offensive northwards from Afghanistan against all three countries (which at least doesn’t seem likely from the Taliban right now unless ISIL gains influence over it), then Russia could foreseeably encounter difficulty in multi-managing three possible air interventions a la the Syrian template, with the possibility of a limited ground component being deployed in Tajikistan. Furthermore, all three of Russia’s potential state brothers-in-arms are susceptible to certain vulnerabilities that could be exploited by a jihadist offensive against them. Tajikistan just had to hunt down and kill a rogue Deputy Defense Minister who suddenly assembled a terrorist gang that tried to overthrow the government, indicating the possible presence of more high-level anti-government figures; Uzbekistan is a bubbling pot of destabilization that might boil over in a hot successionist crisis after the passing of Islam Karimov and enter into all-out Somali/Libyan-style tribal warfare; and isolated and militarily inexperienced Turkmenistan is geographically positioned in such a manner as to make it a very easy target for any rapid ISIL-like offensive across its accommodating landscape, and one which would automatically destabilize Russian, Iranian, and Chinese strategic interests. Complicating matters even further, Tajikistan and Uzbekistan have been in a heated rivalry ever since independence, and it’s questionable to what degree they’d be willing to trust one another to the point of militarily cooperating under the same command, meaning that Russia would most likely have to have at least two separate ones for Tajikistan and Uzbekistan & Turkmenistan. Taking stock of the previous and looking at the worst-case scenario of a coordinated jihadist offensive against each of the three Afghan-bordering Central Asian states, specifically during the time of Russia’s active anti-terrorist involvement in Syria, then it would present a major predicament for Moscow’s military-strategic planners. They would of course have to respond to the deteriorating developments in the region, but as explained above, it could be exceptionally difficult from a logistical-diplomatic perspective to do so, despite having more than sufficient military capability in carrying out the task. This isn’t necessarily a Reverse Brzezinski (which would be an entangling on-the-ground commitment by Russia) so much as it is a systems overload and possible organizational breakdown. This extreme tri-scenario manifestation remains the least likely of the examined anti-Russian revenge responses that the US will take (although it might deploy one of them separately, perhaps as a ‘test’), but given the magnitude of damage that it can cause to Russia’s grand strategic interests, it certainly deserves to be at least considered by all. The COR that Russia has created in the Mideast has the strong potential to revolutionarily transform global politics by dealing a hard blow in the gut of unipolarity’s formerly privileged ‘sphere of interest’. The defeat of ISIL and other terrorist groups in Syria and Iraq would represent a major victory for multipolarity, since it would exterminate the US’ strongest asymmetrical army and lessen the likelihood that it could ever be successfully used in destabilizing the Resistant & Defiant states of Russia, China, and Iran. It can be said that Russia surprisingly ‘changed the rules of the game’ by intervening in Syria at Damascus’ request, since it seems that this totally caught the US and its regional allies off guard. Now that this action has created established facts on the ground, it’s clear to see just how weak the US’ position really is in the Mideast, especially since its two previous pillars of regional power, Saudi Arabia and Turkey, are in real danger of internally crumbling before the eyes of the world. The extraordinarily short time that Russia was able to reverse the status of power in the Mideast through a relatively small bombing campaign testifies to the paper tiger-like nature of unipolar control in the Mideast. If the COR’s momentum keeps up and the terrorists are all soundly defeated, then it’s very likely that the crossroads of Afro-Eurasia will become the most crucial strategic bridgehead in pushing back against unipolar world. But, be that as it may, the US most certainly will not take such an astounding loss lightly, and it’s absolutely guaranteed to push back in seemingly unexpected ways. Whether through Kurdish Turncoats, Refugee Games, or Divide and Conquer between Iran and Russia, the US will not let its grip on the region go peacefully, and it may even resort to indirectly attacking Russian strategic interests in the Balkan and/or Central Asian theaters to distract Moscow from the Mideast and create a exploitable opening in which to stage a counter-offensive. If, however, Russia and its Coalition of the Righteous are successful in securing the Mideast and stymieing the forecasted American destruction of the Balkans and Central Asia, then a new multipolar world order can incontrovertibly replace the unipolar one of old.